The traveller on the A915, the road that runs along this part of Fife's south coast, can find it easy to overlook Lower Largo. 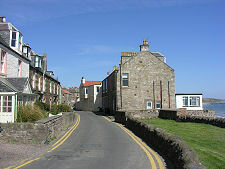 Coming from the west you pass through Lundin Links, a Victorian residential extension of the village, before skirting around the inland side of Lower Largo itself. You can read the full text of the chapter about Largo in D Hay Fleming's 1886 book: Guide to the East Neuk of Fife. Anyone trying to explore Lower Largo can find themselves wandering around the 20th Century housing that fills in much of the space between the A917 and the historic core of the village. But it is worth persisting, because what you eventually find is a remarkably attractive village centre which backs onto the sea, and a very unusual rivermouth harbour. Lower Largo forms one of a pair with nearby Upper Largo. 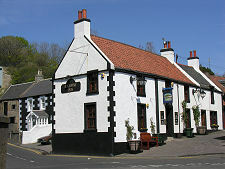 The village has carried a number of different names over the years, including Nether Largo and Seatown of Largo, or further back in time, Largow Burnemouth. 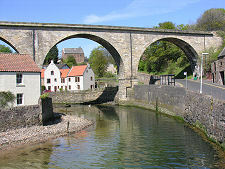 Lower Largo's heart lies where the Keil Burn flows into the Firth of Forth. 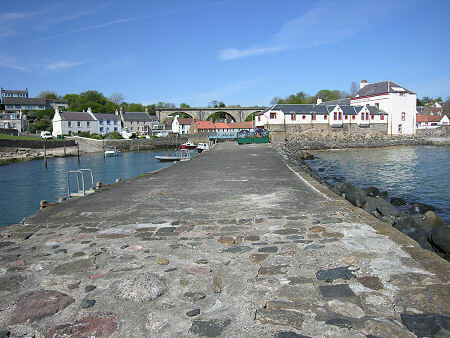 The rivermouth here was already established as a harbour serving a significant settlement by 1500. In 1827 a pier was built on the east side of the rivermouth to provide additional protection, but a full blown harbour of the sort found in other Fife villages on this coast never emerged. 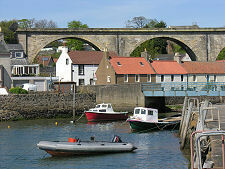 Despite this, by the mid 1800s Lower Largo had a steam ferry service to Newhaven near Leith. 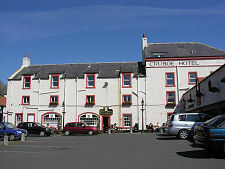 This connected with a coach that ran to the southern terminus of the Tay Ferry to Dundee in Newport-on-Tay. The rivermouth harbour also became home to a herring fleet of nearly 40 fishing boats, and coal was exported from the pier. 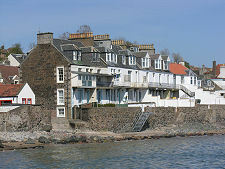 From 1867 Lower Largo became home to a factory producing fishing nets. In 1869 the Lundin Links Golf Club was established and the railway that was built along the north shore of the Forth in the mid 1800s had stations in both Lower Largo and Lundin Links. As a result the latter rapidly developed as pleasant residential settlement: especially once direct trains to Edinburgh began running after the opening of the Forth Bridge in 1890. 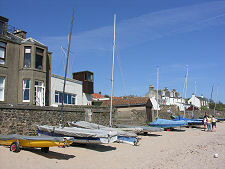 Lower Largo continues to focus on its original rivermouth location, though today this is home to pleasure craft rather than fishing boats. 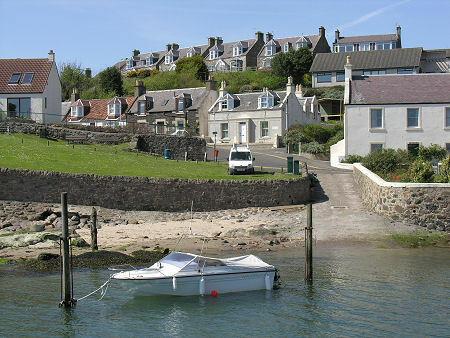 The west side of the mouth of the burn is home to a range of attractive cottages and houses. 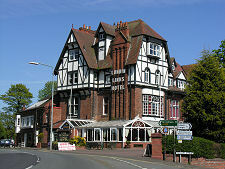 To the east stands the Crusoe Hotel, a converted grain warehouse, and the nearby Railway Inn. A hundred yards inland the burn is crossed by four massive arches supporting the viaduct that carried the (now disused) railway over it. The oldest parts of Lower Largo lie to the east of the Keil Burn. 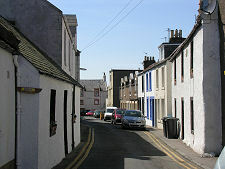 The narrow Main Street winds its way along the shoreline, the houses on its seaward side backing almost directly onto the beach. Access to the beach is possible at a number of points, but when the tide is in, it comes right up to the sea wall behind Main Street's houses. Where Main Street meets Durham Wynd access is possible to a broader beach, used to house many of the smaller boats of the Largo Bay Sailing Club, whose headquarters can be found here. As you move further east the beach becomes steadily more extensive. Main street has one final surprise in store. A pair of ordinary looking stone cottages fronting onto the north side of the road share, at first floor level, a life size bronze statue of Alexander Selkirk, whose adventures were used by Daniel Defoe as the inspiration for his novel Robinson Crusoe. 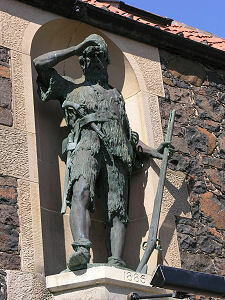 Selkirk's statue stands on the site of the cottage in which he was born.